Ex Libris is a modern restaurant offering Mediterranean cuisine. The average price of a main course dish at the Ex Libris restaurant is 20 euros. The average price of a 3-course meal at the Ex Libris restaurant is 35 euros. Note that although GoMadrid.com strives to maintain all information about Ex Libris up to date, the prices mentioned are only an indication and may not reflect the exact value of your meal. The Ex Libris restaurant is situated within the Lusso Infantas Hotel in the centre of Madrid, and offers modern, beautifully-presented and varied cuisine. The dishes combine typical healthy Mediterranean products with fusion cuisine, and the menu enjoys an excellent price-quality ratio. There is a very select wine cellar, with quality Spanish wines and a good representation of international wines. An economic fixed menu is available from Monday to Friday (not holidays). In the morning it is possible to sample their complete and assorted buffet breakfast. At mid-day and during the evening a traditional cuisine with avant-garde touches is on offer, accompanied by a careful customer service. 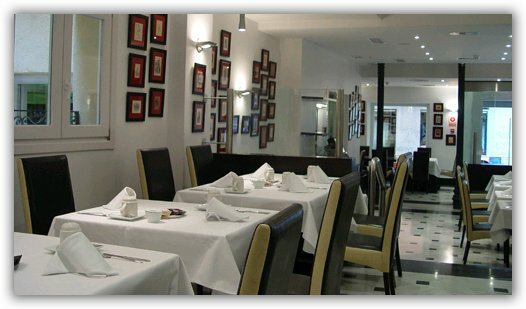 There is also a complete variety of tasting menus and business meals for companies and groups. This restaurant has featured in several culinary publications, each time receiving a very favourable review. The address of the Ex Libris restaurant is: Infantas, 29, 28004 Madrid. The nearest Metro station is Sevilla. Please see the Ex Libris restaurant location map below.